Sep - Project Launch - PL:21 (Transition Ivybridge) idea is presented to the Ivybridge Town Council, in conjunction with IEAG, gaining council approval. Apr - Plant Lots - Seedling Swapping - The first of many events in partnership with others - an exchange of seedlings at the local Farmers Market. May - Process Litter - A showing of the film Message in the Waves and a talk by Richard Thompson of the University of Plymouth, resulting in the production of an Ivybridge Bag now on sale at the Ivybridge Information Centre. Sep - Power Less - Energy Week - A showing of the film An Inconvenient Truth. A Saving Business Energy event with speakers Klaudia Van Gool from Envision, Patrick O' Connell from Bandvulc Tyres and Giles Boardman of Efficient Light. An Energy Fair featuring talks on Energy Efficiency at Home by Simon Holmes of Devon EEAC, Solar Thermal by Gabriel Wondraush of Sungift Solar, Solar PV by Will Grafton of Natural Watt, Climate Change and Dartmoor by Orlando Rutter of DNPA, Wind Turbines by Phil Neate of Neate Services and Biomass by James Morris of Iris Energy. Being attended by over 100 people. Planting of over 100 trees in Filham Park, Ivybridge in order to offset some of Ivybridge's carbon emissions and create a wildlife corridor around the park. Feb - Plant Lots - Seed Swapping event run in partnership with the Ermington Companion Planters at Ermington School. Jul - Permaculture Live - International Permaculture Gathering at Riverside, Cleeve, Ivybridge. Aug - Picture Life - River Junk Man Sculpture by Tess Wilmot & Amanda Pellatt created from junk removed from the Erme during river clean ups. Exhibited at Devon Open Studios event 'Edge' near Widecombe and at Lukesland Gardens. Sep - Process Litter - On going River Erme clean ups and litter picking. Oct - Power Less - participation in Dartmoor and Exmoor's Low Carbon Festival. One member attended the Met Office opening event, which included the Launch of Dartmoor Circle Ltd. Dartmoor Circle is a cooperative social enterprise venture, comprising sustainable living and environmental groups from Dartmoor and its surrounding area. The IEAG/PL21 partnership is a member of Dartmoor Circle and PL:21's Tess Wilmot serves as a director. Ivybridge's activities in the festival included: Low Carbon Event in Ivybridge Methodist Church Hall, Sustainable living themed music event at the Imperial Inn, Walk up to the moor from the town. Nov - Process Litter - Members of PL:21 attended and spoke at the 1st Lee Mill mass incinerator proposal meeting, Chapel Place. 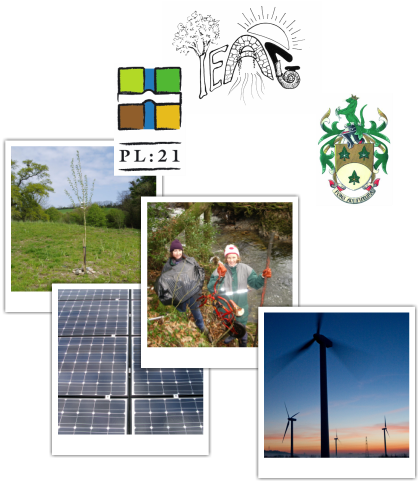 Jan - PL:21 Our Transition Initiative officially became a separate organization with it's own constitution. IEAG becoming a working group of PL:21. Feb - Plant Lots - In partnership with Ermington's Companion Planters, PL:21 had the popular Seedy Saturday event for the 3rd year in a row. Mar - Positive Learning - IEAG organized 4 learning workshops with funding from Learn Devon. These workshops were provided free to participants and feedback indicates that they were enjoyable and effective. This is the first time IEAG has organised training events. Learn Devon were particularly impressed with our applications and our attention to progression routes. The workshops were: Natural Nests led by Amanda Pellatt, Felt Making led by Esin Forster and Diane Wosley, Permaculture in the Landscape led by Tess Wilmot, Trees for Health in Longtimber Woods led by Liz Turner. Apr - Process Litter - Ongoing collaboration with Ecoivy, DAIA, CAVIL, SHFOE, supporting the campaign against the proposed mass incineration at Lee Mill and coming up with viable alternatives. Thanks to everyone who put so much effort into getting as many people as possible to write objecting to the incinerator! Lots of people did write! Also ongoing River Erme clean ups. Jun - Purposeful Livelihoods - Ivybridge gains Fair Trade Status! One of our members, Janet Parsons, along with the guides and rangers have worked really hard to get this acknowledgement for Ivybridge. Also Positive Learning - Elderflowers and wild food Day with Liz Turner of Trees for Health. Jul - Power Less - Micro Hydro on the River Erme – A working group looks at various sites to discuss options. Aug - Petroleum Lite - Cllr Phillip Dredge and the Ivybridge Rail Users Group continue to work hard keeping the trains for Ivybridge high on the agenda. Sep - Produce Local - PL:21's Local Food stall attended the Country Markets 25th celebrations. This is a brilliant example of a local food co-operative and represents an ideal opportunity to promote local food as an ongoing project in collaboration with PL:21. Oct - Produce Local - Apple Pressing At Riverside, Cleeve, Ivybridge. Nov - Process Litter - 'Option 7' Event – A Community Alternative to Incineration - the Watermark, Ivybridge. Culmination of a lot of hard work being put in to come up with an alternative plan to Devon's waste problem. Also Plant Lots - More Carbon Offset Tree Planting in Filham Park, Ivybridge. Jan - Party Lots - Cornwood Wassailing Event - Cornwood has revived the ancient tradition of Wassailing. Wassails are meant to ensure the orchard is safe from 'evil spirits' and that the trees will fruit well again in the coming year. Also Process Litter - 'Option 7' Event - Follow up event to A Community Alternative to Incineration. Feb - Plant Lots - In partnership with Ermington's Companion Planters, PL:21 held its popular Seedy Saturday event for the 4th year in succession. March - Produce Local - Start of Ermington Sustainable Saturday events, run fortnightly to encourage local trade within the village of Ermington to bring - barter - buy - be a part - belong! May - Produce Local - Start of the Local Food Forum at The Watermark, Ivybridge where Tess Wilmot of PL21 and Max Laithwaite of Grow Tavi launched the project to encourage more growers, farmers, gardeners, producers and shopkeepers to both grow and sell local food. Jun - Project Link - Exhibiting at Spring In The Park, Fair In The Square, Lions Funday raising the profile of the initiative within the town, running workshops on forest schools, storytelling, felt making and taking people on wild food walks.